Gets its common name from the dark purple neck band but this is not conspicuous in the field. 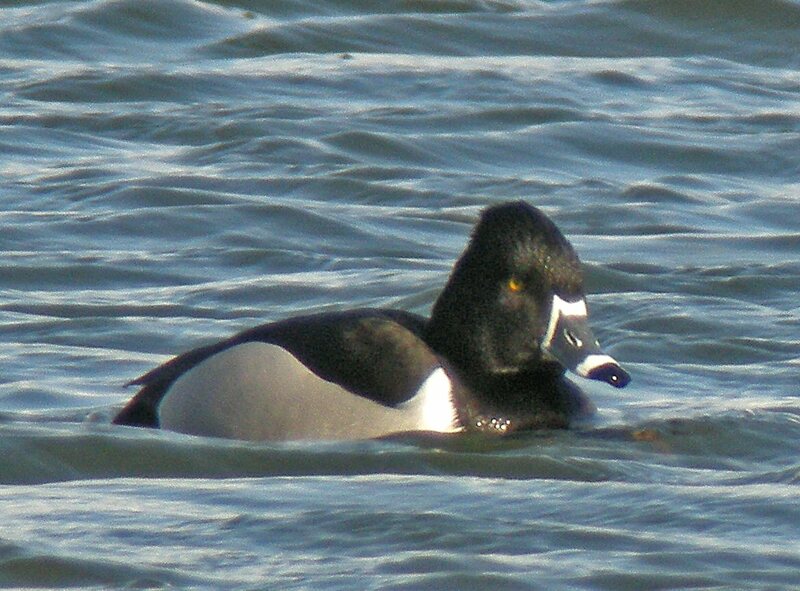 Similar to Tufted Duck (Aythya fuligula) but lacks the tuft and has a high crown at the back of the head. It has a grey bill with a white band, a shiny purple head, a white breast, yellow eyes and a dark grey back. The adult female has a pale brown head and body with a dark brown back, a dark bill with a more subtle light band than the male and brown eyes. The bill is three-coloured, being slate grey with a wide black tip and a white sub terminal band. The adult breeding male has a fine white narrow band to the base of the bill and its nostrils are encircled with white also. Hybridises with Tufted Duck (Aythya fuligula) and even Common Pochard (Aythya ferina). Exclusively a freshwater duck which can turn up at any water site frequented by Tufted Duck with a habit of returning to the same wintering site from year to year. Spring and autumn on passage. A diving duck, feeding on aquatic plants, molluscs, aquatic insects and small fish.They breed in wooded lakes or ponds in Canada and northern USA and overwinter in southern North America. A vagrant from North America, the first UK record was in 1955 but it is now annual with ten or more records a year. However, many records are likely to be of escapees from wildfowl collections. A rare vagrant in Leicestershire and Rutland, first recorded in our area in 1978.